Should Oliver Queen be worried about Isabel Rochev ? Described as "dangerous" and "enigmatically beautiful," Isabel has only been seen in the season two premiere of Arrow, threatening Oliver (Stephen Amell) with a hostile takeover of Queen Consolidated. Though things started off contentious, expect the ice to thaw between the two business associates as time goes on — so much so that it begins to affect one of Oliver’s closest allies. But does Isabel have other motivations ? 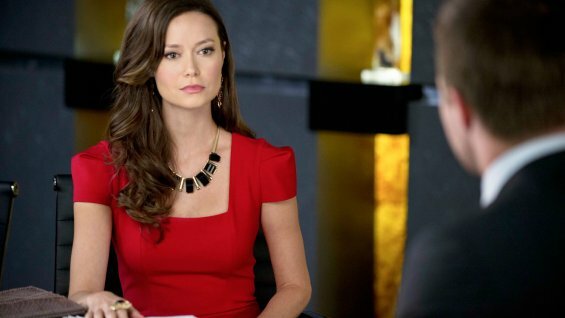 In a chat with The Hollywood Reporter, Summer Glau — who hints that episode six is a pivotal hour ("We’re building into something bigger") — previews Isabel’s return, the budding relationship between Isabel and Oliver, Felicity’s jealousy and more. Your Firefly co-star, Sean Maher, was recently cast on the show. How exciting is that for you to possibly reunite ? Yes ! It is exciting. I just heard from him yesterday [Oct. 24] and he said he just got up there [Vancouver]. Fingers crossed that we’ll get to something together and be on set together again. Even that would be fun. How familiar were you with your character in the DC Comics universe when you got the role ? It was a whirlwind when I was cast in the role. My parents had told me, "You gotta check out Arrow," so I started watching it, and soon after, I got an email : "How’d you like to come recur ?" A few days later I was up there on set trying to read the script and get ready for my work. I hadn’t even realized that my character was in the comics. When I got on set, [executive producer] Andrew [Kreisberg] came up to me and said, "So have you had a chance to check out your character in the comics ?" And I went back to the hotel that night and looked her up. She is a true villainess and super cool. I wasn’t familiar with her before, but I couldn’t be more excited to see what they’re going to let me do on the show. When you did start reading up on her, did that help you develop your version of Isabel ? It’s always helpful just to spark your creativity, even if at this point in the storyline Isabel is meant to be very mysterious. In the way that I’m playing the character, I’m trying to create a slow burn and leave it open for any direction that Andrew decides to take her in. That’s going to start unfolding in this coming episode. Then my character comes back in [the sixth episode] and things really start to change with her relationship with Oliver. In [the eighth episode], there’s more of a hint, and I’m able to show more of Isabel’s backstory. But in the beginning, we’re playing the cards close to the vest. How would you describe Isabel’s relationship with Oliver at Queen Consolidated ? Fair to say it’s contentious ? It is contentious, and it’s a power struggle. They are trying to test each other’s boundaries and test each other’s power and try to set up dominance. It’s not great for Oliver, because, of course, he has this whole other life where he’s constantly fighting life and death, but now here in his own company — in his own boardroom — he’s fighting for control of his family’s business, and she’s constantly keeping him on his toes and constantly bringing him back to the office to put even more energy in that side of his life. Right now it’s really contentious, but it’s going to continue to develop and change over the the next few episodes. Without getting into specifics, how does their relationship evolve over the course of the season ? From my perspective, their mutual respect is going to grow. I think they’re curious about each other, testing the boundaries and really getting to know what the other is made of, their motivations and what drives them. From there, I think the audience will start to wonder what Isabel’s motivations are. There’s speculation that Isabel and Oliver will become more than just business associates. What’s the likelihood of something romantic ? Knowing Oliver Queen — I mean, chances are that something like that might arise. (Laughs) But Isabel is a strong woman, so his interactions with her are going to be complicated no matter how it changes. At this point in the series, we haven’t seen Oliver go up against a female character quite like Isabel. What does she bring to the table that we haven’t seen yet ? Speaking to Andrew about Isabel and also with Stephen, we wanted to explore the fact that she is a different kind of feminine energy in Oliver’s life, and it is absolutely a different relationship from many of the other women in his life. It’s not something that he was looking for and certainly in the beginning, it’s a challenge and a nuisance and something else for him to put his energy into. As it starts to go along, he starts to enjoy their sparring. It’s a different type of woman in his life, who’s demanding different things from him. I think she’s on to him though, at least the way I’m playing it. She’s on him. She wants this company and she wants to know everything about him, so in the next few episodes, as they do inevitably get closer and know more about each other, he’s going to be forced to let her in on how complicated he is. Do you think there’s a good chance she will find out or at least confirm her suspicions ? Right now, it’s all about her trying to control him in the office environment. Speaking of that, how far does she go in trying to secure her hold on Queen Consolidated ? He’s not making it easy for her. (Laughs) As you saw in the season opener, he’s got more going on than meets the eye. He raises a challenge to her and Isabel respects and likes that ; it only makes her want it more. Will Isabel be getting in on the action ? Isabel has mainly interacted with Oliver, but who else will she be encountering ? Most of my interaction is with Stephen, but another character I’m having so much fun with is [Emily Bett Rickards’] character Felicity. The tension between Felicity and Isabel has been playful. I’ve greatly enjoyed being on set with her and playing with the comedy that she allows my character to have. With Stephen, it’s straight-on, it’s a battle, it’s warriors. Seeing her interact with Felicity is pretty fun. Is there a jealousy bubbling underneath for Felicity ? I would say so. I would say that in future episodes, there’s going to be some more tension between the two of them. Isabel’s name is on Robert Queen’s list of corrupt politicians and powerful figures. Is Oliver going to make the connection ? I’m wondering that myself. I do not know what is going to happen. I’m supposed to be going back up [to Vancouver], but I think right now they’re crafting the next plot twist for my character.